January Bay Area home sales were down by 12 percent on an annual basis, following the lowest inventory levels in three years. Silicon Valley posted the largest sales decline, though decreases in all areas were driven by fewer home sales below $1 million. Sales of homes priced between $1 million and $3 million were stronger than the year before. Homes priced above $3 million slowed again, but not in San Francisco and Marin County. Sonoma and Napa counties saw higher year-over-year activity in January, continuing the post-wildfire pattern. Inventory levels continue to trend down, with overall supply down 20 percent from last January and declines seen across all price ranges. Median home prices continue to climb, with overall appreciation in the Bay Area up 12 percent from last January. Despite financial market volatility, the U.S. economy remains strong, with projected 2018 growth the best in a decade. Further increases in mortgage rates will exacerbate the affordability crisis. Before examining January housing market activity in the Bay Area, let’s address recent financial market volatility and how it may affect real estate markets. Much of the recent volatility stems from fears of faster-than-anticipated increases in inflation. Faster inflation could prompt higher interest rates than previously expected, which means that borrowing would become more expensive for U.S. companies and consumers. For investors, this was a sell-off opportunity that was an overdue pullback after strong gains seen in 2017 and at the beginning of 2018. It was expected, as financial markets could not sustainability grow at the rate at which they were growing. It gave investors an opportunity to reposition their portfolios and for markets to line up with fundamentals. Stock-market volatility is not a reflection of the economy, which is still projected to grow at the fastest pace in more than a decade this year. Most economists predict that the U.S. gross domestic product will rise by 2.8 percent in 2018 and that the unemployment rate will fall further below 4 percent. The problem with market volatility as seen over the last week is the impact it has on business and consumer confidence, which can than precipitate into a pullback in demand. However, the risk of a recession has not increased, and economic fundamentals are solid. Higher-than-anticipated mortgage rates could have an impact on the housing market, though Bay Area markets have been less sensitive to rate changes than other U.S. markets. This is particularly due to a large share of cash sales and a higher share of jumbo loans with more than 20 percent down payments. Also, mortgage rates would need to move beyond 5 percent to have a notable impact on the market. While Bay Area home prices continued to surge in January, further increases may become more responsive to mortgage rates than has been the case over the last few years. This is especially true for homebuyers facing affordability ceilings, for whom mortgage rates will play a greater role in how much house they can afford. Thirty-year, fixed rate mortgages increased 10 basis points to 4.32 percent for the week ended Feb. 8 according to Freddie Mac’s Primary Mortgage Market Survey. At the same time last year, mortgage rates were at 4.17 percent. In mid-March 2017, rates peaked for the year at 4.3 percent, then preceded to fall to about 3.78 percent at the end of the summer before rising again. So far this year, following a volatile stock market, the 10-year treasury yield continued to climb, and the 30-year, fixed-rate mortgage rate is up by 33 basis points since the start of the year. While we may see more volatility in financial markets and increasing mortgage rates, Figure 1 provides a historical look at mortgage rates, which are still hovering near historic lows. Nevertheless, even with higher-than-expected mortgage rates, housing market activity in the Bay Area is not expected to change much. Demand will continue to outpace the supply of homes on the market and drive prices. The lack of inventory has been the main driver of surging Bay Area prices — a trend that is not expected to change. More likely, home price growth will moderate from double-digit percent growth to single-digit percent growth, as suggested in Pacific Union’s Real Estate and Economic Forecast to 2020. Figure 1: 30-year, fixed-rate mortgages since 1976. With January and February typically the slowest months of the year for home sales, it is still hard to tell what 2018 holds for Bay Area housing markets. January home sales activity has generally trended continuously lower for the past five years, and activity this January dropped by 12 percent year over year. The drop in sales was not unexpected following the lowest supply of homes on the market in the last three years in December. San Mateo County saw the largest relative decline in year-over-year home sales at 21 percent, with most of the drag coming from homes priced below $1 million, which were down by 63 percent. In contrast, sales of San Mateo County homes priced between $2 million and $3 million more than doubled from last January, while the higher-end market above $3 million paused again. Santa Clara County January sales mirrored San Mateo County activity, though swings were less dramatic. Two markets where sales increased from last January include Sonoma and Napa counties, both up by 5 percent to 6 percent, where activity is still being driven by post-wildfire activity. The other Bay Area markets posted annual declines ranging between 10 percent and 15 percent. With most markets posting fewer home sales, the trend is still being driven by large declines in sales of homes priced below $1 million. Otherwise, sales of homes priced between $1 million and $3 million increased from last January, particularly for homes priced between $2 million and $3 million, which rose by 43 percent. This continues a trend that was seen throughout 2017. In contrast, a strong increase in sales of higher-end homes, those priced above $3 million, cooled slightly in January, with activity down by 6 percent year over year. Nevertheless, that was not the case in San Francisco and Marin counties, where sales of higher-end homes increased. Figure 2 summarizes January’s year-over-year change in home sales by price range. Note again that the Wine County saw post-wildfire sales activity grow across all but the highest price range. 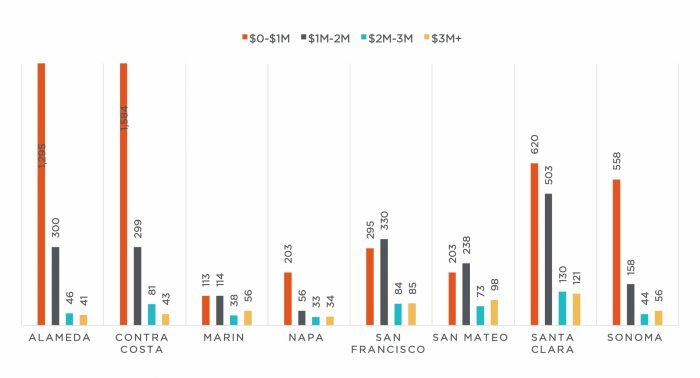 Silicon Valley generally saw growth in the $1 million to $3 million range, while San Francisco and Marin counties benefited from sales of homes priced above $2 million. Lastly, East Bay sales — particularly in Contra Costa Country — slowed again this January, a trend intermittently seen throughout 2017 in that country. We will monitor slowing sales of homes priced above $3 million, as that price segment showed particular strength in 2017. On a year-over-year basis, activity in this price segment slowed only once last year, posting a 5 percent decline last February following a very strong jump in January. Figure 2: Year-over-year change in home sales by price range and Bay Area county. Tight supply conditions remain the biggest challenge for Bay Area housing markets. While inventory has generally declined on an annual basis for the last few years, January posted another 20 percent year-over-year drop. January’s decrease was relatively larger in Santa Clara and San Francisco counties, both of which saw inventory drop by nearly 30 percent. 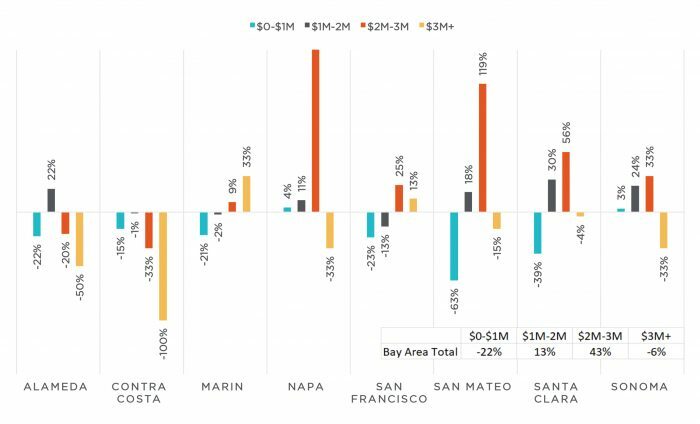 Also, for the overall Bay Area, all price ranges posted year-over-year supply declines, though with increases in higher price ranges in some regions. The seasonal decline does not necessarily mean that overall inventory in 2018 will be lower. In 2016, for example, a larger-than-usual seasonal decline in January was followed by a strong increase in inventory during the summer months. Hence, it is still hard to tell what the spring homebuying season will bring. Nevertheless, Figure 3 illustrates the number of homes on the market by price range. 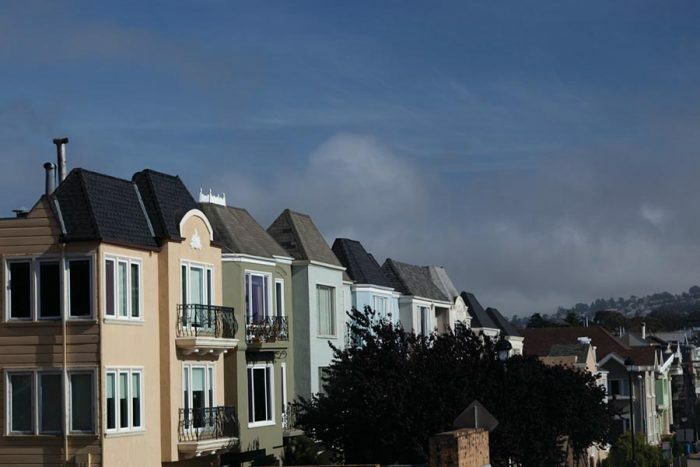 Generally, the East Bay leads the region for the most affordable homes. Overall, inventory levels were up by 6 percent in January from December. December is usually the month for the lowest inventory levels. Historically, the monthly increase in January has varied, and at times, inventory has declined further in January. Nevertheless, only Napa, Marin, and Sonoma counties posted declines in inventory from December, again the result of post-wildfire activity. Figure 3: Number of homes for sale in January by price range and Bay Area county. Low inventory continued to fuel home prices in January, pushing up the median price by an average of 30 percent year-over-year in Silicon Valley. The large increase was in part due to more higher-priced sales, with the median price in San Mateo County reaching $1.33 million for all residential properties and $1.44 million for single-family homes. Overall, the Bay Area’s median price was up by 12 percent from last January. Note that January is the seasonal low point for home prices. Also, not all local counties benefited from double-digit percent median price growth. Napa County posted the lowest growth rate, less than 1 percent, while Contra Costa County followed with 6 percent growth. Sonoma County, where prices accelerated by 16 percent, saw the most price growth for homes priced below $1 million, which rose by 15 percent. As is evident from sales statistics, Sonoma County’s housing market is being driven by post-wildfire activity and families in search of affordable homes. In addition, Sonoma County’s inventory pool saw an increase in lots that resulted from the fires. In January, there were more than 50 lots under contract, up from only about two last January. Figure 4 provides a compelling summary of median home price growth in the Bay Area over the past 18 years, and it also highlights the annual seasonality of home price changes. With a median price of $910,350 in November 2017, Bay Area home prices reached yet another historic peak.